The Apollo 10 lunar module Snoopy approaches the command module Charlie Brown before docking in lunar orbit. The Apollo 10 mission in 1969 simulated a descent to the lunar surface. The mission's crew of Thomas Stafford, Eugene Cernan and John Young went through the steps of separating the command module spacecraft from the lunar lander (also called the lunar module) and bringing the lunar module through the first part of its descent to the surface. Although Apollo 10 stopped short of landing on the moon by about 50,000 feet (15,000 meters), it was a key test ahead of the successful Apollo 11 landing of July 20,1969. The astronauts of Apollo 10 were among the most experienced NASA had. Stafford was the commander of Apollo 10. A U.S. Air Force flight test instructor, he was part of the second group of astronauts to join NASA in 1962. He already had two spaceflights behind him: Gemini 6 — which featured the first rendezvous in space with another maneuverable spacecraft — and Gemini 9. He later was commander of the first Apollo-Soyuz mission. Cernan, the lunar module pilot of Apollo 10, was aboard Gemini 9 as well. He performed a spacewalk during the Gemini 9 mission. Before joining NASA in 1963, he was a U.S. Navy aviator. Cernan later became the last Apollo astronaut to walk on the moon as commander of Apollo 17. A few officials within NASA (including George Mueller, NASA's head of the Office of Manned Space Flight) originally wanted Apollo 10 to go all the way to the moon's surface, according to an account by journalist Andrew Chaikin in his 1994 book, called "A Man On The Moon. "(Penguin Books, 2007). But the plan to touch the moon was vetoed for a couple of reasons. 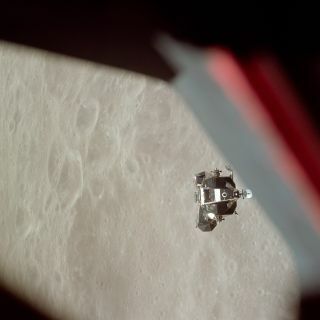 First, Apollo 10's lunar module was too heavy for descent; switching to a lighter lunar module would be a last-minute decision that would delay the flight. Second, there were too many unknowns, including the difficulty of predicting the moon's gravitational field. The moon has concentrations of mass (informally called "mascons") that can pull at an orbiting spacecraft, moving it closer to the surface. While such movements are no big deal in orbit, they can make a big difference during a landing. The mission initially ran smoothly. Apollo 10 performed a smaller "first" on the inaugural day of the mission, when it broadcast color video from space for the first time. The video showed the docking between the command module "Charlie Brown" and the lunar module "Snoopy," as well as the interior of the command module. The crew of the Apollo 10 space mission. Left to right are Eugene A. Cernan, lunar module pilot; John W. Young, command module pilot; and Thomas P. Stafford, commander. But chaos erupted when Snoopy's crew was ready to head back to Charlie Brown. Due to a series of small errors on the crew's part, the ship's guidance system was pointing in the wrong direction. It began to spin — wildly, by some accounts — as it flew less than 8 miles (12 kilometers) above the moon's surface. The startled Cernan radioed a rude exclamation ("Son of a b----!") on an open channel to the world. He and Stafford struggled to get the ship under control before they lost the navigation system altogether, or worse, crashed the ship. After a few heart-racing seconds, the crew regained control and the spinning stopped. In relief, Stafford told Mission Control, "We've got all our marbles." NASA later said that the spinning was due to human error. Because of an errant setting, the lunar module's abort-guidance system was searching for the command module, which it was not supposed to do at that time. (This abort mode would have brought the lunar module back to the command module in case of emergency.) The agency made note of the error to warn future crews. About 5.5 hours after leaving Charlie Brown, Snoopy returned the crew. The two craft joined up on the far side of the moon and when the crew re-emerged, Stafford radioed, "Snoopy and Charlie Brown are hugging each other." On the way home, the crew had another first: the first shave in space. They used safety razors, a thick shaving gel and a wet cloth to do the work, then displayed their beaming, freshly shaven visages when interviewed from space in a conversation with NASA that was broadcast on several television channels in the United States. "We felt reborn," Cernan later recalled in his autobiography, "The Last Man on the Moon"(St. Martin's Griffin, 2000). The crew zoomed back to Earth, reaching a top speed of 24,791 mph (38,897 km/h) relative to Earth on re-entry, and splashed down safely in the Pacific Ocean on May 26, eight days after launch. According to Cernan, the first recovery helicopter to arrive at the command module had a cheery sign drawn on the bottom: "Hello there, Charlie Brown!" The 50th anniversary of Apollo 10 is in 2019. Charlie Brown is on permanent display at the Science Museum in London, while Snoopy is on a permanent orbit around the sun. As mentioned, Apollo 10 served as a crucial dress rehearsal for Apollo 11, which landed two astronauts safely on the moon in July 1969. NASA followed that up with six more lunar landing attempts between 1969 and 1972; only Apollo 13did not meet that objective, due to a severe mechanical difficulty that forced the mission to return to Earth. NASA refocused its human exploration program on low Earth orbit in the 1970s, moving to programs such as the space shuttle and the International Space Station. In 2017, however, the agency was asked by the Trump administration to bring humans to the moon again before heading to Mars. The agency is in preliminary design work for a lunar space station, called the Deep Space Gateway, and is also working on the Orion spacecraft to bring humans to the moon in the 2020s.